Simmins, Geoffrey. "Architecture". The Canadian Encyclopedia, 31 January 2017, Historica Canada. https://www.thecanadianencyclopedia.ca/en/article/architecture. Accessed 22 April 2019. 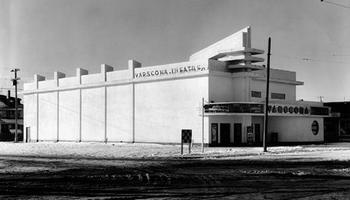 Edmonton, Alberta, designed by Rule, Wynn and Rule, 1940 (courtesy Provincial Archives of Alberta, Alfred Blyth Collection BL/254/1). 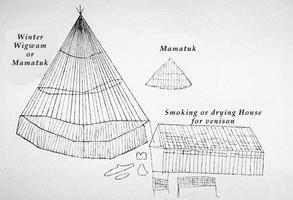 The Mamateek (Beothuk winter wigwam and summer wigwam) and Smokehouse, drawn by Shawnadithit, 1820s. First published in James P. Howley, The Beothuks or Red Indians: The Aboriginal Inhabitants of Newfoundland, 1915. Classic definitions of architecture hold that it is "the mother of the arts." Today architecture is more likely to be defined, not as an art, but in technical terms, or as an expression of a given society's values. 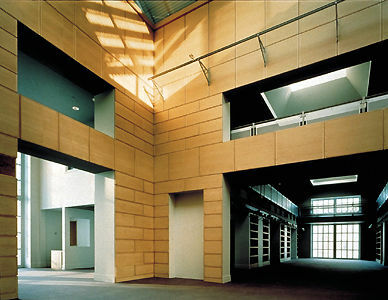 What we refer to as architecture can include structures that are modest and ephemeral as well as monumental buildings; often the distinction between architecture as a high art and architecture as a reflection of simple vernacular traditions seems irrelevant to the appreciation and experience of built form. The late American architectural historian Spiro Kostof called for "a more inclusive definition of architecture and, consequently, a more democratic view of architectural history." This democratic approach to defining the term architecture seems to suit the Canadian tradition, where the story of our built environment has been written by artists, craftspeople and builders whose origins, backgrounds and reasons for building have been very different. A broad definition of architecture - one that calls for a balance between artistic and technical factors as well as between folk and high-art traditions - is not new. The Roman architect and theorist Vitruvius (active 46-30 BCE) wrote that architecture needed to possess three qualities, usually rendered in English as commodity, firmness, and delight: good planning, sound construction, and a sense for beauty. Vitruvius required all three elements to be present for a building to be "architecture." But each of these characteristics has links to the cultural norms and technological processes of a given society. All buildings, from tipis to churches, can tell us about the societies that created them - what they valued, how they marshalled construction teams, what technology they could call on, and what abstract values they espoused through the buildings they commissioned. Neither function nor art is sufficient to explain what architecture is; a building is more than the sum of its parts. Architecture is a social statement rendered in three dimensions. By leaving the definition of architecture somewhat open and inclusive, we are free to explore the subject in a number of ways at the same time. If we look at it historically, over a long stretch of time, we can trace the evolution of style and the multitude of influences which come together in the creation of the built environment. An historical approach exposes key relationships between architecture and other disciplines - sculpture, drawing, engineering and urban design, to name a few. Most of us, however, experience architecture in relation to certain generic building types. We live in a house, worship in a religious building, go to work in skyscrapers, spend our money in shopping centres, feed our cars at gasoline stations, stay overnight in a hotel, go to hospitals when we are sick or seek recreational outlets in one of a variety of sports facilities. Barns and grain elevators, places of work for some Canadians, are cultural landmarks to many others. 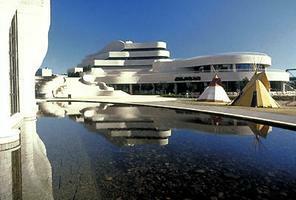 Designers of buildings, from the untrained (who simply want to design and build their own lakeside cottage) to the highly trained and experimental designers of major public monuments (such as Douglas Cardinal, who designed the Canadian Museum of Civilization), are more than practitioners of architecture. They are adding to the record of our built environment and to our understanding of what architecture is and what role it plays in our lives. Canadian architectural history is most easily understood by linking it with political developments. Indigenous architecture in Canada was created during the period before European contact and took on a different character following contact. First Nations peoples in this country produced unique architecture, both temporary and permanent. In the former category are included such ephemeral structures such as the igloo, wigwam and tipi; in the latter are included pit-houses and wooden longhouses of the northwest coast. These buildings are not only technically ingenious and original, but reflect deeply held cultural belief systems that make the buildings rich repositories of spiritual and religious significance. Contemporary indigenous architecture continues to be practised, and embraces both traditional and contemporary materials and forms (see Architectural History, Early Architecture of the First Nations). If Canada's aboriginal people have created an enduring architectural legacy, European traditions have marked Canada's architectural history with its buildings and its ways of categorizing and describing them. Many of the terms used to describe architectural styles in Canada have been adopted from a European critical tradition. The first European visitors, however, did not establish permanent settlements. 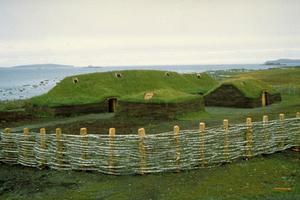 Canada has some fragmentary archaeological remnants of Viking contact, specifically the Newfoundland site of l'Anse aux Meadows, which dates to c 1000 CE. Basque sailors, attracted to the rich fishing banks off the east coast of Atlantic Canada, also left traces of their sojourns here, such as Red Bay, Labrador, which dates to the middle of the 16th century. 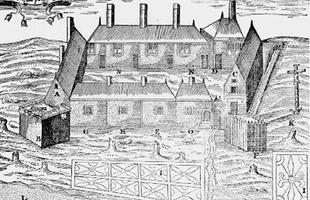 European architecture of permanent English and French settlers is first seen during the 16th century. Thereafter, until well into the 19th century, we continue to categorize Canadian architecture with reference to its cultural origins in either French or English Canada. During the French Regime, from 1608 to 1759, many significant stone buildings were erected, for ecclesiastical, public and military purposes. French military Fortification and urban planning traditions were imported. 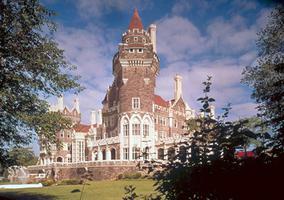 Royal architects from France ensured that a high level of craftsmanship and planning was maintained. 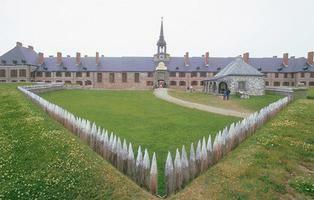 The fort of Louisbourg (destroyed 1758 and rebuilt from the 1960s) is the most significant example of French military planning in North America. British influence is seen first in the fortifications it constructed against the French presence in North America - and then the American presence. Modest block houses were built, and then more elaborate forts. Urban planning and domestic architecture soon followed. Comparing the geometric plan of Halifax (established 1749) with the more organic plan of Quebec City shows the very different ways that the French and English laid out cities. After the Conquest of Québec (1759), British traditions gradually came to dominate. Québec and other cities laid out during the French Regime took on a new and decidedly English character (see Architectural History, Architecture under the French Colonial Regime). Architecture from 1759 to 1867 is referred to by reference to British royal traditions: the Georgian and Victorian periods. The Georgian period is associated with the development of refined domestic architecture. American Loyalists brought their own traditions into Canada, particularly in Atlantic Canada and present-day Ontario. The Victorian period is associated with the development of many public buildings, especially from the 1840s through the 1860s. These were often built much larger than the cities that created them could afford, because the cities that sponsored them were vying for settlers and government commissions. 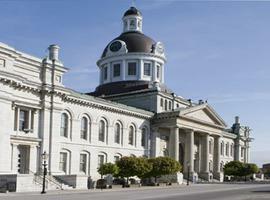 Examples include Montréal's Bonsecours Market and the Kingston City Hall. 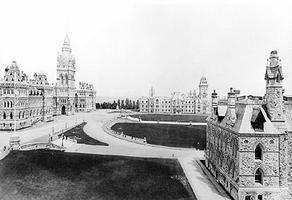 Universities were built, such as University College, University of Toronto (see Architectural History, 1759-1867). Following Confederation in 1867, until World War I broke out in 1914, peoples from countries other than England and France immigrated to Canada, bringing their architectural traditions with them. 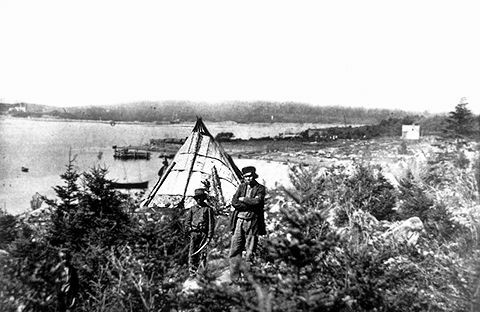 American Loyalists and German immigrants during the 18th century had already made their presence felt particularly in Atlantic Canada towns such as Lunenburg; during the 19th century, Scottish masons brought excellent skills to the Ottawa Valley, in such towns as Perth. Central Europeans, particularly from the Ukraine, arrived, interested in exploiting the agricultural hinterland in the west made newly accessible by the railway. They left an enduring architectural legacy. An example is the Ukrainian church formerly at Smoky Lake, Alberta, and now in the Canadian Museum of Civilization. Perhaps in response to the growing cultural diversity of Canada during the period from 1867 to WWI, architects and government officials sought a national idiom. 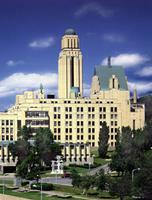 The Parliament Buildings, Ottawa, made the British-inspired Civic Gothic Style influential for a time. Against this residual British influence was the increasing influence of the Americans, who pioneered skyscraper technology during the latter part of the 19th century. Canadian architects struggled under the dominant shadow of the USA, whose architects, some Canadians felt, were given an undue share of available work in Canada. There was increasing pressure throughout this period for architects to professionalize (to create self-regulating organizations responsible for setting and maintaining standards of practice). During the latter part of the 19th century, architecture, surveying, and engineering became separate professions. Architects debated whether their training should take place via apprenticeships or in universities (see Architectural History, 1867-1914). Following WWI, Canadian architects continued to seek an appropriate national idiom and gingerly experimented with European modernist traditions. Architects such as John Lyle sought a national expression through the use of regional ornament. 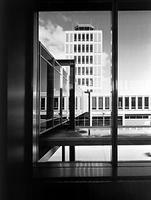 But architects such as Ernest Cormier denied that national themes were appropriate and called for the development of an international style in Canadian architecture. During these years, and not without considerable difficulty, the first women began to enter the profession of architecture. Following World War II, Canadian society embarked on a feverish period of city-building, in response to returned veterans and the resulting baby-boom. Cars became affordable for many people, and suburbs transformed the way Canadians lived. Architecture was given a boost by specific recommendations made in the report of the Royal Commission on National Development in the Arts, Letters & Sciences (commonly known as the Massey Report, 1951), which recommended that Canadians develop a Canadian idiom in architecture, and proposed steps to ensure this. The Modern Movement in architecture became popular, particularly in Vancouver, Winnipeg and Toronto (see Architectural History, 1914-1967). By 1967, when Canada celebrated its centennial with Expo 67, architects such as Arthur Erickson were acclaimed internationally. 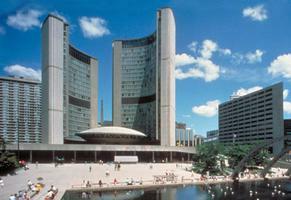 Following 1967, Canadian architecture developed in many different directions. Individual architects pursued personal visions. Some, such as Alberta's Douglas Cardinal, brought aboriginal sensibilities into the Canadian mainstream. Others, such as Eberhard Zeidler, brought European sensibilities into Canada, and gained fame internationally. 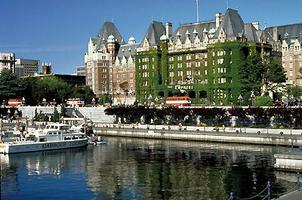 Canadian cities grew rapidly, and many older buildings were demolished. The Heritage Conservation movement, which upheld the retention and restoration of our architectural history, began (see Architectural History, Canadian Architecture 1967-1997). While the search for a Canadian idiom in architecture is ongoing, it is generally recognized that regional differences will contribute to a diversification of architectural expression, rather than a single dominant national idiom. Canadian architecture will thus become as diverse as the rest of Canadian geography and society. Hazel Conway and Rowan Roenisch, Understanding Architecture: An Introduction to Architecture and Architectural History (1994); Harold Kalman, A History of Canadian Architecture (1994); Spiro Kostof, A History of Architecture: Settings and Rituals, Second Edition (1995); Carol Herselle Krinsky, Contemporary Native American Architecture: Cultural Regeneration and Creativity (1996); Hanno-Walter Kruft, A History of Architectural Theory from Vitruvius to the Present, trans Ronald Taylor et al. (1994); Rhodri Windsor Liscombe and Michelangelo Sabatino, Canada: Modern Architectures in History (2016); David Watkin, The Rise of Architectural History (1983). Ramsay Traquair: The Architectural Heritage of Québec This website is devoted to architect Ramsay Traquair and the Traquair photographic archive in the Canadian Architecture Collection at McGill University. Search for more than 7,000 images of architectural buildings and silver artifacts. New WestminsterOfficial website for the City of New Westminster, BC. 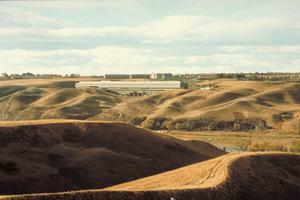 Check out the extensive gallery of "Designated Heritage Sites" and other online resouces about local history.